For the past couple of years, I’ve documented the details of a whole day in the life of our family as part of a homeschooling link-up. A couple years on, I find it fascinating to look back at a typical day at home in our house in 2010, on the road in New Zealand in 2011 and while living out of our shed in Queensland to see how things have changed for us! 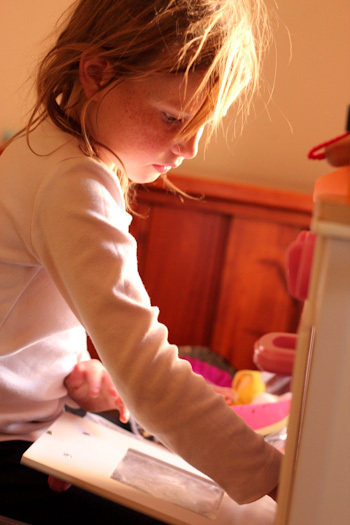 I’m an Australian single mama, living permanently on the road in a housebus with four daughters and unschooling quite deliberately. Aisha is 8 and a half. Brioni turned 7 yesterday. Calista is 5 and a half. Lana (Delaney) will be 4 at the end of the year. Today, we are visiting friends in the very centre of Australia: Alice Springs. We first met the Edinborough family at their home in New Zealand sixteen months ago. Pip and Grant Edinborough unschool their three children too: Tom (7), Kate (6) and Meghan (3). Although it’s Monday, today feels more like a Sunday for the Edinboroughs because Grant is home all day and no activities are planned. We're parked in the front yard of a suburban house, living out of our little bus but spending a lot of time inside with our friends. I get up when Brioni needs help finding a new roll of toilet paper. One of the characteristics of living in a tiny space like The Gifted Gypsy is that essentially we sleep, cook and toilet in the same room. Brioni has been up in the night vomiting, and so her first question this morning is “Can rats vomit?” We already know that rats can’t burp — this information was gleaned when we first got the rats and read through their dietary restrictions — but I hadn’t thought about vomiting before. I reach for my phone and google the question. The answer is no. This is the beauty of home-educating in the age of information technology. We don’t need to consult a textbook or visit a library to discover new facts, we simply look them up online. Our home-educating tools are mostly technology-based: the girls each have their own tablets (which we call kipis), and I’ve recently subscribed to a mobile internet service and set up wi-fi in our bus. The girls have unrestricted access to Skype and YouTube, but they aren’t yet using email programs or a web browser. Three girls are sleeping with me in the bed we share. In the early morning, Calista decided she wanted to move and made a new bed for herself on the floor of the bus, underneath our suspended bed. Brioni comes back to bed, and we doze for a bit longer. Brioni and Lana have both woken. I hand my phone to Brioni — a birthday message to her has come during the night — and she reads it while I use my laptop to bring up the other good wishes that appeared via email and on Facebook. We talk about our lovely friends Delcie and Alan and browse our blog to see where we last camped with them to which we will be returning to camp with other unschoolers next month. We like using our blog to remember our friends and reminisce over good times in the past. At this time, Brioni asks another random question: “When is lychee season?” She loves the fruit and is looking forward to having it again. We google that, discover that Australia has a long lychee season (from October to February) and this leads to a discussion on hemispheres and opposite seasons. 3yo Lana looks at the map of Australia and asks where we are. Already she has an understanding of cartography because we refer to maps often during our travels. One of the first things the girls like to do in the morning is greet their rats and play with them for while. I enter the house and greet the occupants. Lana has requested porridge for breakfast, and so I ask all the children if they would like some so I know how much to cook. After I set the porridge going, I move into the laundry to continue the never ending process of sorting, washing, hanging and bringing-in the clothes. Calista is still sleeping in the bus, and Brioni has just gotten up and is playing with a rat. Late mornings aren’t entirely unusual for us, as the girls sometimes stay awake until the early hours of the morning. With Brioni being sick in the night, I wonder if Calista is feeling unwell too. Everyone else is fed, and the kids are pretty chilled, playing quietly together. Yesterday was a high-energy day with Brioni’s birthday celebrations. Lana is partially watching a movie at the same time as playing with toys. Pip is baking her youngest daughter’s birthday cupcakes, and the kids move in and out of the kitchen, helping where possible. Although it's almost noon, Calista is still dozing, having chosen an unusual place (and position) although she must be comfortable enough. Brioni is definitely not feeling well. Although she's come in from the bus, she only wants to lay down on the couch and so I start reading stories to her, and other children gather around me to listen in. Kate particularly likes watching and mimicking Pip's work in the kitchen. 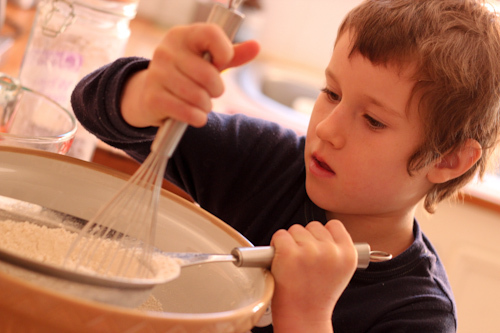 The measuring, multiplication and timing of baking is one of the most ubiquitous examples of mathematics in action, and the lessons are seamlessly integrated into our children's days. By now it’s clear that we have several kids who aren’t feeling very well. Calista is up, but she’s not 100%, and even Tom is more mellow than usual. 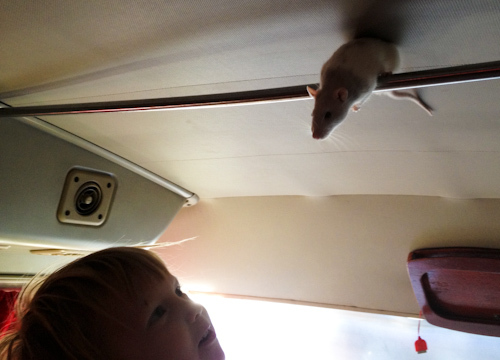 Only Kate is her usual, exuberant self, and now that the bus is not occupied, she can play in and out of it — interacting with the rats. We were planning an outing to one of the terrific national parks around Alice Springs, but can see that today is better spent at home. One of the beauties of home-educating without an agenda is that we can be flexible instead of forcing our children to fit to a schedule. Once she notices that her friend is online, Aisha starts writing a message in Skype. Since Skype was enabled on their kipis, Aisha and Brioni have been writing (typing) a lot more and asking how to spell many more words. They're motivated by the desire to write properly to their friends, using the same vocabulary with which they speak. 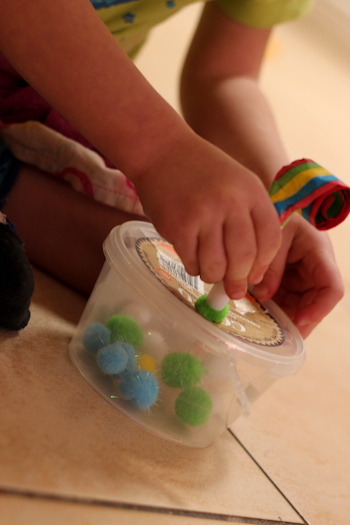 We introduce Lana to pompom pushers, a game that hones fine motor skills as the child pushes small pompons into a container. 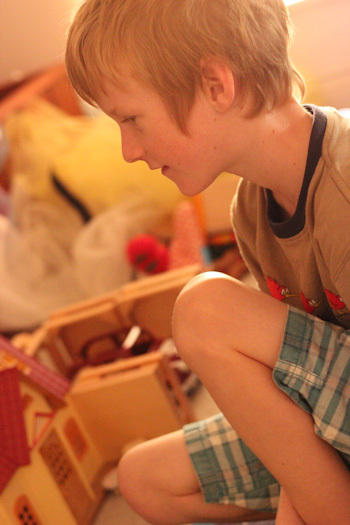 The kids move into the playroom and engage in a complicated game with different "families". I start doing some repairs on the bus which includes giving the bus an oil change. This is my big lesson for today, for this is the first time I’ve done an oil change, and I use my bus manual to make sure that I’m doing everything correctly. 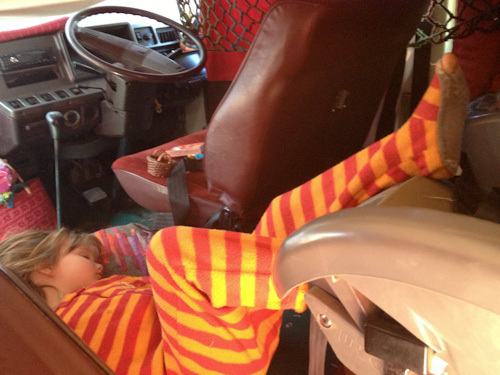 I open up the engine hatch inside the bus which gives the kids something to examine and discuss. While I’m inspecting the underside of the engine, Lana crawls under the bus to see what I’m doing. I’m pleased that my girls see me working on mechanical maintenance, it demonstrates that mechanics are not necessarily a masculine field. With three out of seven children not very well, we’re all in a mellow mood. The kids are playing quietly with Lego, on their kipis or in the playroom. Calista is napping in the bus again, and both Lana and Brioni have had baths. Without a daily routine, our girls are just as likely to have baths in the middle of the day as they are to have them in the evening. When the other kids move out of the playroom, Aisha starts tidying the toys, carefully sorting and putting each kind away together. I don't force my children to help out with the chores, instead I focus on demonstrating a cheerful attitude to my daily tasks so that they don't learn an aversion to work. Minecraft is a very popular game among homeschooled children, but it's not just the older kids who like to create their own worlds. 3yo Lana often chooses to play Minecraft and loves to talk about her creations with her sisters and friends. 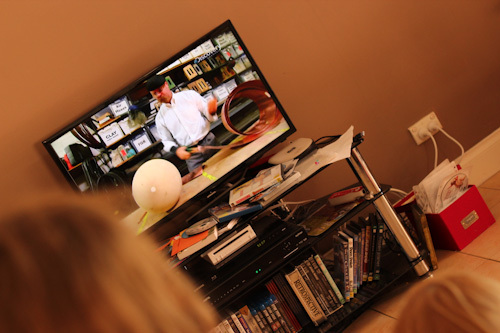 When Mythbusters comes on TV, the kids gather around to watch the episode. Tom summarises the hypothesis and experiment for us when Pip asks what it's about. His casual oral report demonstrates that Tom understands the physics of the case and has formed his own opinion about the outcome. Without being asked, Brioni checks the rats’ cage and tops them up with food and water. She loves to play with Shadow, and Kate loves the rats almost as much as she does! Brioni asks me to clean the cage, so I take it out and wash out the bottom tray with plain vinegar before rinsing it with water from the hose. We like to minimise our exposure to chemicals, and this means that we clean with natural products — even for rats! It’s Meghan’s third birthday today, but she’s not inclined to celebrate it today, perhaps instinctively responding to the fact that not everyone is well. A present is left untouched on the dining table and Meghan doesn’t want her cupcakes today. It doesn’t matter — we can have a party tomorrow! But Meg has requested pizza for dinner, and so that’s what we have! The kids all watch a movie together after tea, and then I move our girls into the bus. The Edinborough children wake early and go to bed early, and taking our children out of the house instantly makes it easier to put Tom and Kate to bed. When the bed is made, the girls cheerful climb into their sleeping suits. 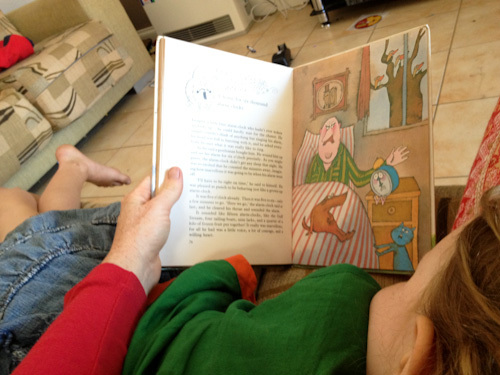 We often go to bed as a family and read or watch a movie before falling asleep. Usually I go to bed at the same time as the girls, lying alongside them in our bed, sharing their movie or using earphones to listen to an audiobook. But tonight I decide to stay up late with Pip. It’s our last planned night together (at least for a little while), and we still have lots of stories to swap! 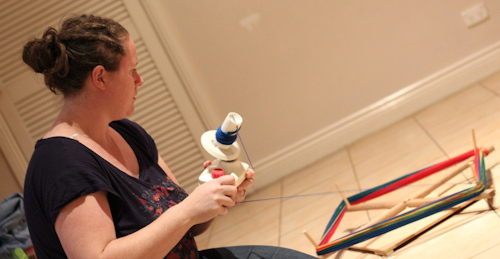 With the kids tucked into bed, it's adult time, and for Pip that means a chance to play with wool! Pip received some custom-dyed skeins in the mail today and eagerly spins them into balls using a wooden swift made for her by Grant and a vintage winder bought in an op shop. I’m using my computer at the dining table while Pip knits, and we both don’t get much done because we’re talking so much. It’s lovely to be living alongside friends — even if it’s just for a short while. Today has been a quiet day for all the children, not necessarily typical of our more adventurous style, but the respect and freedom which we have extended to the children has been the same as every other day. I’m glad to have recorded this day, especially because it has been shared with such good friends, and I look forward to seeing where we are this time next year! Great post! But I’m curious about unrestricted access to youtube and skype. I don’t know so much about skype, but youtube has SO much inappropriate stuff on it. 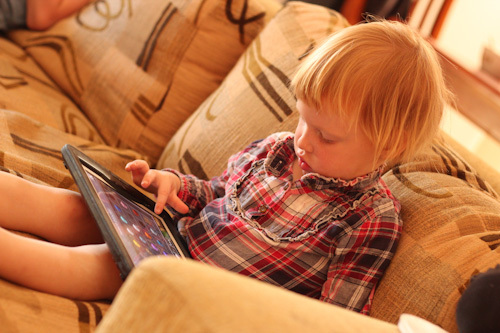 Do you use any type of parental controls or settings at all? Or am I maybe over-reacting? I’ve never let my kids (8 and 5) just browse youtube – they don’t use screens much, so I’m a bit of a newbie to all this. I love this day. It is like so many of our days – focused on the most important needs of the time, whether that’s rest, nesting, catching up with friends on Skype, real-life friend time, a Mythbusters marathon or a rabbit trail that starts exactly like yours done – reaching for the phone to answer a question. Many blessings to all of you. I’m so glad you were able to spend some time with friends who “get” you! Very interesting to read about your day. I can see how the kids learn about all sorts of different things but I am curious about how they learn to read and write at the early stages. Have they just shown a curiosity about letter names and sounds? Do you feel that they are learning at a different pace (whether that be faster or slower – not that it is necessarily detrimental to learn at a slower pace) than if they were in a more formal setting. How would you approach the situation if one of your children didn’t display a natural curiosity towards learning to read or write? Oh I just want to grab Calista, put her in a comfy bed and soothe her. How awful to be out in the bus by herself when she is ill. This sounds like an okay one-off day but to live like that? Going to bed at all hours, unrestricted you-tube..you can’t really believe this is best. I think your selfish and your girls are suffering. I know this comment sounds awful and I am sorry for that but my heart aches for these girls. Just my own two cents…my girls have mostly unrestricted YouTube access…I’ve set the explicit control but that’s it. They’re still supervised which is how I know that they just don’t bother watching things that I deem inappropriate, they do it instinctively. One daughter loves how-to videos, particularly for her Monster High dolls, and she also researches the mythical characters those dolls are based on (one reason I like them compared to Barbie LOL). My other daughter is quite enamoured with ‘gross’ videos like botflies and pus…which is quite awesome really, I like that she’s interested in something so different yet natural. My girls are in the public school system and we live quite a mainstream life in many ways (not that that matters, just adding it in for those interested). If you looked through the blog Fran you’d see there are many ‘traditionally’ comfy spots that Calista could have picked, including a secluded bed at the back of the bus, hammock style sleeping areas, or if she really wanted, I’m sure their hosts would have accommodated her in a bed. Your notion of Calista being uncomfortable is just your own notion, not Calista’s. Nobody forced her to sleep there, she chose it for herself. I too, have to comment again. As I have before-my heart breaks for your children. They crave structure. All I learned from this post is that your idea of learning is playing on an ipad all day and pointing out things that they see and googling them to learn more. While this is fine, these girls also need to be grasping the basics they will need to be successful: reading, writing, spelling. What if one of the girls wants to go to college one day to be, say, a doctor? I feel like you are intentionally pushing a lifestyle on these children that is setting them up for failure. 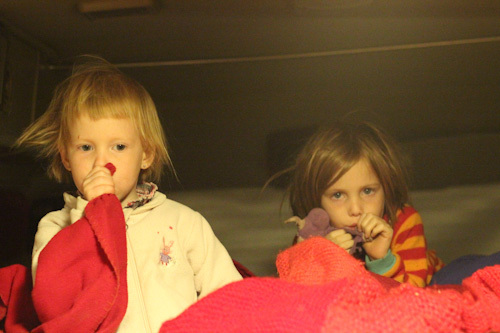 It makes me so sad to see your little ones on your blog, crammed into a bus, with no end to their travels in sight. While its fine to live how YOU want to live-you are being selfish by dragging innocent children into it. This was such a wonderful read thank you for sharing your day with me! While my almost 4-year-old goes to a Steiner kindy I love the idea of home schooling and I especially love having my mind and heart opened with posts like these. I’m disappointed at some of the closeminded comments on here – perhaps if people like Junebug and Fran might find a better place to air their views somewhere more mainstream? Just because someone lives differently to your slim world view does not make it wrong. As my mum always said, there are a million right ways to parent and only a couple of wrong ways. I can’t imagine a more exciting, nurturing, inspiring and wonderful way of parenting and living as you are doing with your children Lauren. Kudos to you for your vision and bravery and determination. I loved reading about your day! The way you described how unschooling works in real life was brilliant. I also let my daughter (10) use YouTube unrestrictedly. But that doesn’t mean that I don’t supervise. I am there with her fielding questions and guiding her internet use in a respectful way. I live is a low socio-economic area, where the kids are not cared for and have no one to love them, I see no evidence of this in Lauren’s blog or Facebook posts. In fact I believe because the girls are homeschooled they are advantaged, for example they weren’t forced to go to school or kindy while sick as many children are, simply because parents have work commitments. Also I feel that while this is a more detailed snapshot of Lauren’s and the girls day, we don’t hear every conversation and see every cuddle. We don’t know how Lauren is attending to the girls needs – and I have never seen anything that would make me think she wouldn’t. So I think it best to refrain from making judgment calls based on a blog post. Here, in our home educating community, there is such a vast collection of different home education styles. Every single home educating family I know does it in the way that suits their family best. That is the beauty of home ed….freedom and choice and control. Also, none of us actually wake up one day and simply decide hey, let’s keep our kids at home and disadvantage them. It’s quite simply the opposite. Education is a right. And as responsible parents, we have every right to educate our families in the way we feel suits. We travel a lot, between Aus and NZ. Even though we don’t live in a bus, we still do a lot of our learning as we travel. I enjoy reading blog posts about all different types of home education, it widens my view of the world and the possibilities it has to offer. Thanks for adding to that. On another note, please don’t be discouraged by the many judgmental and incredibly patronizing comments above. Judgement and fear come from a place of ignorance. A, everything you’ve written tells me YOUR parenting is unsettling, not Lauren’s. For starters the mere fact you’d try to send your sick child to school if you could get away with it tells me you don’t care about your child’s wellbeing or infecting other people’s children. I would much rather have an open and loving mum who allows a bit of screentime on the occasional sick day like Lauren than a judgmental and condescending mum like you. As Yeshe pointed out this is merely a snapshot of ONE day. You have made assumptions not only about their whole life but also about what I have read in the blogosphere. Your arrogance is impressive, I’ll give you that. I’m so glad you shared this day. I can really relate to your life, minus the travelling holiday of course. I live in a small town, always routine. My husband is never home. This is our day. Morning – kids wake and watch telly or play mine craft. They have unlimited time too. It’s so much easier to parent , isn’t it. I hate having to entertain them all the time. And on the computer they have so much fun! I also answer silly questions like do rats vomit by google searching and giving them a quick answer. They go to school and I don’t like it because I have nothing to do when they are gone. I wish they didn’t like it so much. In the afternoon we watch tv like myth busters too. I wish I could also travel like you and meet new people that I wouldn’t have to see again all them time because I struggle to maintain friendships. I admire you’re freedom and easy lifestyle. I always find it amazing that someone can read the exact same piece as I am and come away with an entirely different view. I marvel at the freedom and interest that fills the lives of the girls whilst someone else worries about their lack of structure. Believe me they are getting more out of hands on interest based learning in a day than most children in a formal classroom will get in a week. Horses for courses and all that, but I worry more about the children who are stifled from kindy, forced to ‘compete’ through reading levels and assessed from the minute they walk in the door.